The cruise starts from Ormos Panagias, situated in N-E of Sithonia peninsula in Chalkidiki. From this seaport we will go on with our journey, sailing towards the south of the Athos Peninsula, until we reach the south limit, where the highest point is 2.033 m. From here we shall sail north, along the western coast. 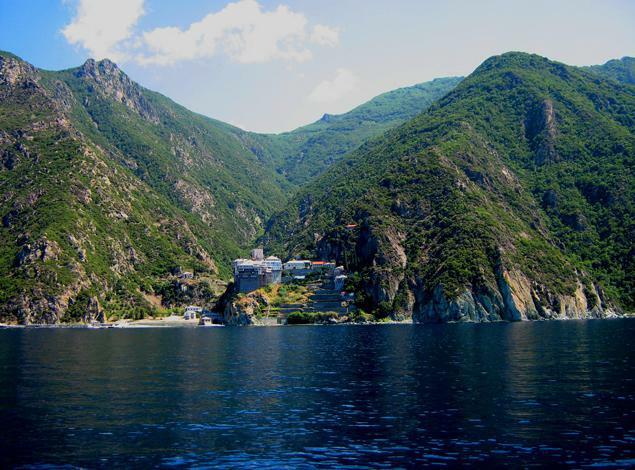 You will be able to see from close (from the boat), the mysterious and miraculous place which has been for centuries the center of Orthodoxy and you will find out new information about the history of Mount Athos and 8 of its monasteries. After approximately 4 hours we shall stop in Ouranoupolis, where you will have enough free time to discover this village, to take a walk, to shop or to have a traditional meal at one of the best taverns there. On our way back from Ouranoupolis, the boat will sail to the west, to Ormos Panagias and for 1 hour and a half you will watch a wonderful program with traditional dances and Greek music. The cruise will finish in Ormos Panagias. If your place of accommodation shall be in Thessaloniki, the bus will be waiting for you there to drive you back to your hotel.